12oz bottle into SA perfect pint. A: Pours a light golden yellow with a huge dense bright white head that slowly faded into a faint scum leaving a network of streaky lace down the glass. S: Light crackery malt, mild lager yeast, crisp earthy hops and peppery spice. T: Follows the nose with bready malt, a light sweetness, spicy leafy hops, and doughy yeast. Crisp overall. M: Medium-light body, slick clean crisp mouth, perfect creamy carb. O: One of the best you can find in a six pack. Easy to drink, flavorful and clean. I am definitely partial to pilsners, and a great pilsner really gets my taste buds excited. The simplicity. The crispness. Well, this beer looked perfect. Bright golden straw colored, crystal clear with a solid white head of dense foam. The aroma gives off a strong bouquet of typical Saaz hops, or at least something similar. I love it  In this beer they are pungent, musty, oily and earthy. Hearty and warming. All those elements bond easily with a slightly sour graininess. The taste doesnt disappoint  Light and grainy sweet with a warm bready character - very pleasant going down and has a soft bitterness. Lemony notes are detected. Mellow and extremely smooth with just the right amount of bitterness in the aftertaste  it leaves your palate wanting more. A world class pilsner that, IMO, is underrated here. Appearance-sunny yellow body poured into the glass, pure gold. Large white head that widens and settles well into the glass. Appetizing. Smell-Hop notes immediately, surprisingly floral, hints of grass and bread as well, well hidden alcohol. Taste/Mouthfeel-crisp flavor, slightly hoppy but balanced with a grainy finish of breaded malt, slight alcohol burn, impeccably smooth, light to medium mouthfeel, notes of grass and lemon. Nice flavor. Drinkability-very drinkable, solid light flavor, not too complex but appetizing layers. Overall-an outstanding pilsner, great flavor, nice balance, very drinkable. A triumph. Pours a beautiful yellow with a white head and incredible clarity. Smells of fresh cut grass, lemonade, and a faint sweetness like animal crackers. Tastes similar with the slight lemon up front with a pils malt sweetness; not too dry or too sweet or too tart or bitter. Just well balanced. Also an excellent drink ability here. Pints go down super easy. An excellent American Pilsner! This 12 oz green bottle of Trumer Pils poured a crystal clear straw color and had a fluffy white head that persisted and left a nice lacing on the sides of my glass. Small bubbles evolved rapidly from the sides and bottom of the glass throughout. Trumer Pils has an aroma of bready, grainy, clean malt. The noble hop character is quite pleasant and fairly dominant in the aroma profile. The flavor of this beer is certainly dominated by the hops, which is good in my opinion. A pleasantly assertive hop bitterness and a spicy noble hop flavor dominate the clean bready malt flavor. Trumer Pils has a light body with a medium mouthcoat it finishes dry and has a good degree of carbonation with a pleasant carbon dioxide bite. In case there was any doubt that an authentic German Pilsener could be reproduced in the US, the Trumer Brauerei has proven it possible. I highly recommend this beer to those who enjoy the style, as well as to others who would appreciate that authentic beer styles need not be bound by region. Very clean German pils. Very subtle initial sulfur aroma with crisp, slightly malty taste. A little bitterness lingers in the aftertaste. Very refreshing. 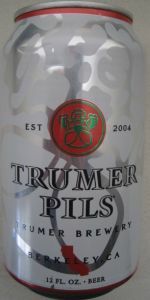 Trumer Pils in Berkeley, CA has succeeded in brewing an authentic German-style Pilsner on the West Coast. If you enjoy the crisp, not-too bitter bitterness of German Pilsner, I highly recommend Trumer. German Pilsner is my favorite style of beer. I've sampled Pilsner throughout Germany as well as dozens of domestic Pilsners. Trumer is the first domestic Pilsner I have encountered that successfully replicates the taste and mouth-feel of classic German Pilsner. If I did not know Trumer was brewed in domestically, I would have guessed the beer was imported from Northern Germany. A- I don't know how a pilsner could ever look better. Poured into its own glass, and it looks exactly like the picture in the ad in BA mag. Half a GLASS of head after a medium strength pour, light golden with fluffy, perfectly white head that laces beautifully. S- Sweet balanced malt and hops, with a very light barley flour note and a hint of corn. T- Well- balanced between malt and hops, leaning a little towards the hops in the end, leaving a slightly bitter aftertaste... But so close to the perfect pilsner... There's a bit of barley flavor, as well as some white bread and a hint of alcohol, but all is so well-balanced and delicious that it's as if you're drinking summertime, springtime, golden wheat fields, sunshine, gold, beautiful young women playing in those wheat fields, birds chirping, the blue sky, flowing brooks, and a rocking chair that you sit in next to either your lover, best friend or granddad as you look and listen and take in all the beauty. That's what it tastes like. M- Smooth, clean, refreshing. carbonation could be a little higher, but other than that it's spot-on. A bit dry in the finish. D- Well, after hearing what it tastes like... Go get a six pack, sit down and enjoy your front porch and the sunshine and breeze. You could drink this all day, and well into the night. Served in logo'ed straight Trumer Pils glass. Poured a clear golden color with an inch and a half of tight, bright white head that had good retention and a surprising amount of lacing. The aroma was a slightly sweet and muted combination of grassy and grainy aromas. The taste was nice and crisp, clean and balanced, refreshing and smooth. No single flavor stood out. The body was pleasantly full for the style. It was also very smooth and balanced. The drinkability is truly great, having several is an excellent idea. This is not only my favorite Pilsner, it is the best Pilsner I've ever had. Worth seeking out and enjoying. pours a crystal clear lemon straw hue into a Trumer glass with active carbonation bubbling steadily. A bubbly and foamy three-finger cap fades fairly quickly to a thin foam that leaves bits of spotty lacing. aroma is grainy and light malty with hints of sweetness, hints of bitterness, and a bit of lemon zest. relatively mild, even for a pils, but not unappealing. tastes of grain, lemon, floral and grassy notes, and some herbal hops. taste is much less sweet than aroma, with a nice lingering bitter herbal hop note. Mouth is drying, crisp, clean, and full of lively carbonation that coats the tongue and drys with just a slight astringency. fresh and smooth. drinkability is solid, just as this is a solid example of a stateside brewed German Pils. Enjoyable, refreshing, and all around true to the style. Sits a pale gold with absolute clarity in the glass with a thin, delicate layer of head that clings to the glass. Tart pale malt, honey sweet aroma with unmistakable German lager phenols and sweet soapy acids. Walnut is in there somewhere and gets stronger as it warms. Tart, sweet, and bitter at the same time, but the bitterness lasts with a very mild flowery ester flavor. Banana ester is also in there with the nuttiness, which makes itself apparent with time. Medium body with a dry finish. Less filling, tastes great. This beer takes me back to Munich and helps me understand why people like lagers. I can drink this all day and not feel full. No wonder the Germans stick to this style without complaint! If only the big three could make something close to this. Instead of just tasting like lightly flavored water, this has many subtle flavors to it, with different notes being played a little louder with each gulp. I'm pretty happy this is brewed an hour away from me in Berkeley. A trip to Deutschland is only a six pack away. Poured into a cylindrical Trumer glass. Clean and golden with a fluffy white head that leaves some nice sections of lacework all the way down. And oh boy, look at all them bubbles racing to the top in beaded streams. Aroma is a blend of grains, hops, grass, citrus. Flavor is malted grains up front, spicy hops follow with a hint of lemon and a dry finish. Nice balance of flavors and a nice crisp mouthfeel make this a great choice. On draft at the Whip In in Austin, Texas. Appearance (3.5): A very clear straw yellow. Not much head which reduces to nearly nothing. It's got some legs though. A bit of lacing at the top but not much beyond that. Smell (3.5): Not a whole lot here. Strong spicy hops for the style, but not much in the way of grains. Clean. Taste (4): The spicy hops hit immediately up front and are even a bit floral. Tastes like Saaz and a lot of it. A bit thin up front but this fills out a bit and leaves a little sweetness to complement the floral hops on the back end. Mouthfeel (4.5): The carbonation is noticeable right away. Dances on the front of the tongue. High carbonation and light to medium body. Slick at first but the hops stick around and a leaves a lingering spiciness in the back on the roof of the mouth.